DON'T go all the way to England to take a holiday cruise of just one week, two weeks or even three weeks – go in August of this year and indulge a whole 4-weeks cruising from Dover to Athens by way of France, Spain, Portugal, Corsica, Sardinia, Italy, Sicily, Malta, Montenegro Croatia and Albania. 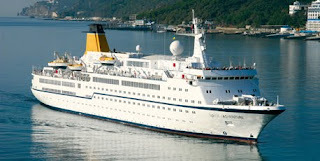 The 350-passenger small-ship Spirit of Adventure will sail this 21-port cruise on August 19, and if booked through Cruiseco by April 17 a fly, cruise and stay package includes return air and taxes from Sydney, Melbourne or Brisbane, two hotel-nights in London pre-cruise with breakfasts, transfers from hotel to Spirit of Adventure in Dover, the 28-night cruise with all meals and entertainment, two hotel-nights in Athens post-cruise with breakfasts, and onboard gratuities. FURTHER ITINERARY DETAILS: Spirit of Adventure's ports of call in France include Rouen, Lorient (for Concarneau,) and Bordeaux (overnight,) in Spain she visits Bilbao, Ferrol (for Santiago de Compostela,) Leixoes (for Oporto,) Seville (overnight,) Malaga, Motril, and Barcelona (overnight,) then Bonifacio in Corsica, Olbia (Sardinia,) Naples in Italy, Sicily's Trapani and Catania, Valletta in Malta, Kotor (Montenegro,) Hvar and Dubrovnik (Croatia,) Sarande (for Butrint) in Albania, and Piraeus the port of Athens.